Good news! J and I spent spring break vacations building the long-awaited compost toilet thing at the farm. It’s basically finished except for flooring, roof and, well, other stuff. We are hoping to cover the inside walls with unique art, ranging from rusty old metal fertilizer signs to mummified rattlesnake skins. We are hoping Mo will contribute one of her brilliant works to hang for all time in the C.T.’s airy enclosure/building/thing. In return, you both will receive a free weekend at the farm and unlimited, private use of its ‘”unique” running/biking trails (watch out for the armadillo-dug hole on the back stretch of the Hillside “Leg Breaker” Trail). Also, both of you will be invited to grand opening of the composting toilet thing, which will be named in your honor. The “art sign” should be waterproof and not something a giant farm rat will want to nibble. Mo is excited to be invited to exhibit at such a prestigious gallery. And we have the perfect artwork! It’s a Texas flag on an old piece of tin. Patriotic yet ratproof! We’ll have to get rid of Flat Stanley, an annoying visitor from the East who has totally overstayed his welcome and is cleaning out the Ugly Pug stash. It’s yours next time we visit the farm. Thanks for the honor, Bob! 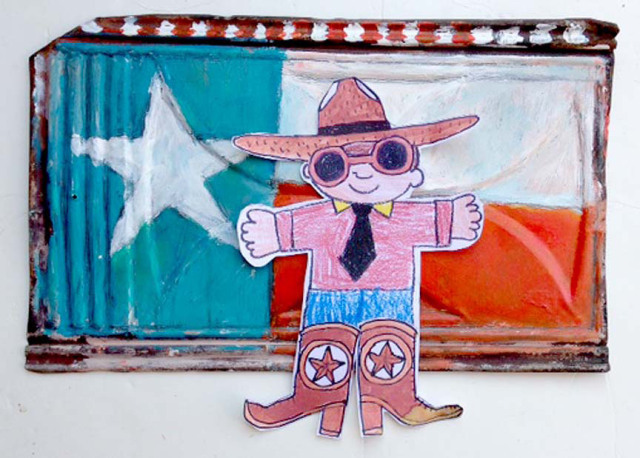 This entry was posted in margarine and tagged art, life, west texas waltz. Bookmark the permalink. This may be the greatest letter I have ever read. Seems like everyone in the Garbo family is an amazing writer. I wanna have dinner with you guys…and since I don’t imagine a lot of talking at the Smith dinner table…I just wanna pass notes under the table. I know they will be hilarious and well-written and I will re-read them when I am sad. If Flat Stanley is drinking all of the Ugly Pug he definitely needs to hit the road.. don’t come between a man (or woman) and her Ugly Pug..